Following three back-to-back mega-sale events leading up to Diwali, India’s eCommerce companies once again opened the discount floodgates heralding Christmas and New Year. This time around, Fashion was the battleground category of focus for Indian e-retailers. Myntra launched its End of Reason Sale held between 22nd and 25th December. eCommerce behemoth Amazon too announced its own grand Amazon Fashion Wardrobe Refresh Sale on the same days, while Flipkart hit the market with its End of Year Bonanza held on the 24th and 25th of December. Paytm and Snapdeal held sale events as well, starting 23rd December. All competing sale events promised consumers up to 80 percent discounts across a range of products, especially in Fashion. At DataWeave, we analyzed and reported on the competing pricing strategies of Amazon, Flipkart, Myntra, Paytm, and Snapdeal. 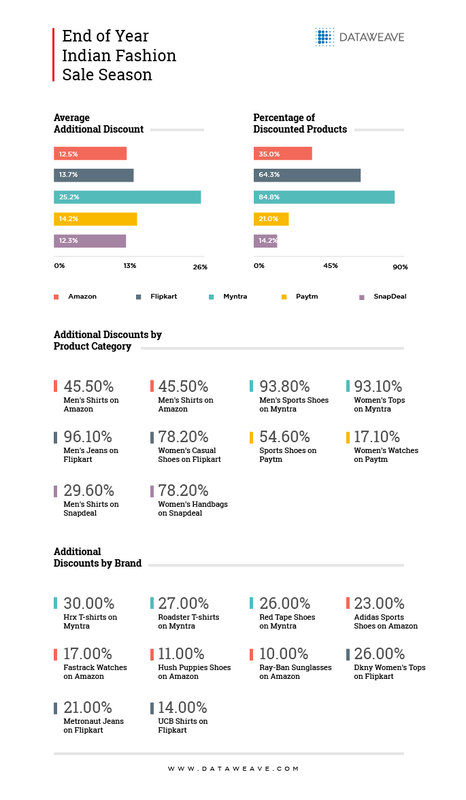 In the following infographic, we look specifically only at additional discounts offered on the top 500 ranked products of over 15 product types during the sale, compared to those before the sale events went live. Myntra elected to discount over 84 percent of its Top 500 ranked Fashion products encompassing each product category, with an average additional discount percentage of over 25 percent offered during the sale. A prime example of this discounting approach was the sports shoe segment, which received an aggressive additional discount of 28 percent on over 93 percent of the Top 500 ranked sports shoes. Similarly, Myntra’s additional discounts ranged from between 22 percent and 25 percent across most product types, including T-shirts, Shirts, Handbags, Jeans, Skirts, Sunglasses, and Watches. The fashion e-retailer’s private label brands enjoyed attractive reductions in prices, which include Hrx and Roadster, along with other brands like Red Tape, Nike, and Puma. Amazon discounted 35 percent of its Top 500 ranked Fashion products in each product type, with an average additional discount percentage of 12.5 percent during the sale. Given Amazon’s track record of dynamic pricing, this was relatively conservative. Overall, additional discounts on Amazon ranged between 4 percent and 16 percent across all product types in Fashion. Top brands discounted on Amazon included Adidas, Fastrack, Hush Puppies and Ray-Ban. Flipkart too joined the End of Year discount action with several attractively positioned offers, exceeding those featured on Amazon. Flipkart discounted over 65 percent of its Top 500 ranked Fashion products in each product type, with an average additional discount percentage of over 14 percent during the sale. Additional discounts promoted on Flipkart ranged between 8 percent and 22 percent across all Fashion product types, while some of the top discounting brands included Dkny, Metronaut and United Colors of Benetton. Conspicuously, other Indian e-retailers like Paytm and Snapdeal chose not to join in the price war. Snapdeal, especially, has consistently offered only moderate additional discounts during recent sale events, choosing to focus more on other areas of improving the user experience for their shoppers. In contrast to the profit-sapping Diwali sale season, characterized by steep discounts across all product categories, this end of year sale was more concentrated, largely honing in on Fashion. From a strategic and shareholder perspective, limiting the discounting action to Fashion insulated the retailers’ bottom line from another major profit hit. Myntra determinedly reaffirmed its leadership status in the Fashion category, with its highly aggressive discounting strategy. This was well received by shoppers, who spent a staggering ₹5 crore in only the first five minutes of the sale. Flipkart opted to double down this time around with attractive offers on its own eCommerce platform as well. The e-retailer, currently locked in a battle with Amazon for leadership in India’s eCommerce sector, had acquired Myntra in 2014 in a bid to strengthen its position in the fashion category. Amazon, intriguingly, opted for a more conservative approach to its end of year sale than we are used to witnessing from the eCommerce giant. As we enter the new year, and kickstart yet another cycle of aggressive e-retail promotions in India, there will be ample opportunities to see if this is evidence of a rethink in Amazon’s approach to pricing in India. If you’d like to know more about DataWeave’s technology, and how we provide Competitive Intelligence as a Service to retailers and consumer brands, check out our website!